Maize, also known as corn, has been around for a very long time. It has a wide range of benefits from biofuel, medicine, chemicals, ornaments, fodder and most especially, human food. Corn is an essential ingredient in cornbread and a lot of other baked products, Mexican food especially tortillas, popcorn, and even corn flakes as cereals usually eaten during breakfast and paired with milk. It is used in salads, garnishes and side dishes. Corn is relatively easy to cook too. It can be boiled or roasted. I have a great passion for corn and truly enjoy its taste. There are a whole lot of fabulous corn recipes out there primarily because with an ingredient as simple as corn, you can already do so much. I also appreciate nuggets so I thought of combining the two and making corn nuggets. Yummy! This is an excellent recipe for corn nuggets. It is simple to follow and will not puncture your wallets or eat up a lot of your precious time. 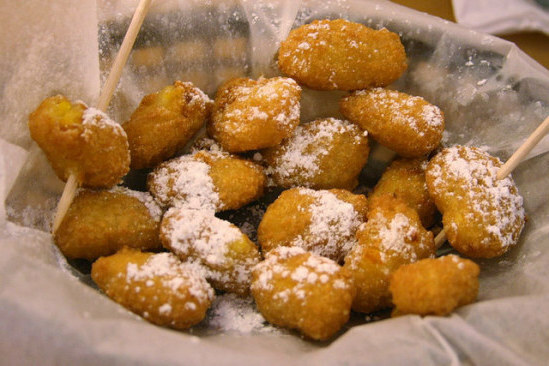 Make your own corn nuggets today! Drain the can of whole kernel. On a medium sized bowl, stir the whole kernel and creamed corn together. With the use of aluminium foil, the baking sheet must be lined. The next step is to coat it utilizing cooking spray or vegetable oil. Now put spoonfuls of that corn mixture on the sheet. Freeze this inside the freezer so that they will become firm. Approximately, this takes around three hours. In a skillet that is large and deep enough or deep – fryer, put an inch of vegetable oil. Heat this to a temperature or level of 350 degrees Fahrenheit (or 175 degrees Celsius). This is now the time to prepare the batter. The batter consists of the egg white, pepper, salt, milk and the cornmeal. Mix the aforementioned ingredients in a bowl. Dip the corn nuggets that have frozen into the batter. And then, quickly fry the corn nuggets in the hot oil. Continue to cook the nuggets until they turn golden brown in colour.